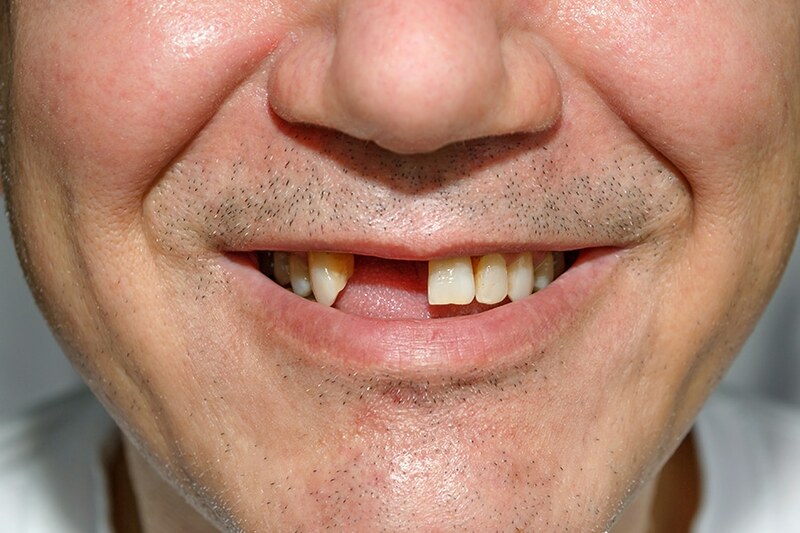 What Are the Causes of Tooth Loss in Adults? Tooth loss in adults is a worrisome situation simply because losing their teeth can impact health, self-esteem, and the ability to talk well. Many things can cause tooth loss including both preventable and unavoidable conditions. For individuals at risk of losing permanent teeth, understanding these causes can help to minimize the worst outcome. Good oral health and dental care minimize the risk of tooth loss in many people. However, there are numerous reasons a person can lose his or her adult teeth. Poor oral hygiene is a common cause of adult tooth loss. Proper care involves brushing and flossing the teeth daily to remove bacteria and debris from the teeth, gums, and oral cavity. When this does not occur, bacteria overwhelm the person’s natural immune system, making it possible for the bacteria to damage the tooth, gums, and bone structure. Though good oral hygiene is important, proper dental care from a professional is essential. Dentists can remove the plaque and buildup surrounding the gums and under the gum line, minimizing the risk for further development of decay. Additionally, dentists also can pinpoint areas of concern early on, limiting the risk a tooth will be lost as a result of a dental problem or complication. Gum disease occurs when bacteria invade the area just under the gum line. It works its way downward into the structure of the tooth. Gum inflammation, the beginning stages, is known as gingivitis. If left untreated, this condition will worsen to periodontitis, or gum disease or periodontal disease. In these situations, the gums bleed from the presence of inflammation. They pull away from the teeth, exposing the structure of the tooth including the root. Over time, the bacterium damages the bone, loosening the tooth and allowing the tooth to fall out. Individuals who are diabetic are more likely to develop periodontal disease. Those who have diabetes have a limited immune system. This means it is more likely the individual will struggle with infections. Gum disease is a type of infection and inflammation. Over time, it causes the loss of tissues in the mouth, worsened because the immune system struggles to overcome the damage. This leads to gum loss, bone loss, and tooth loss. Smoking creates a number of oral health concerns, many of which can contribute to permanent tooth loss. Smoking or chewing tobacco causes damage to the gums themselves by limiting the proper flow of blood through the area. This nearly always creates a limited amount of protection from the body’s immune system. But, the damage continues. Smoking also can cause gum disease. Because of the weakened immune system, the body cannot fight off the buildup of bacteria in the mouth. And, this causes the development of periodontal disease, as noted in other examples. Smokers are at a higher risk of developing tooth loss because blood cannot get to the area to restore healthy gum tissue as easily. Individuals with chronic high blood pressure may also be at a higher risk of developing gingivitis and gum disease. Individuals with high blood pressure often take medications, called antihypertensives. Some of these medications can cause the gums to grow rapidly. They can change the shape and structure of the gum line. Over time, this can make it difficult for the individual to clean away all of the bacteria present in the mouth. It also leads to a loosening of the gum tissue against the tooth. This allows bacteria to get into this area as well. This, as noted, causes gingivitis and periodontal disease. In many ways, the loosening of the gums themselves can allow teeth to become loose. This increases the risk of a tooth falling out as a result of the overgrowth of tissue. Rheumatoid arthritis can cause some damage to the bones of the mouth. This includes damage to the jaw bone. Over time, this condition weakens these joints and the bones themselves. The bones help to hold the tooth in place. In some people, individuals may experience a pulling away of the gum tissue from the teeth. This further loosens the tooth, allowing it to fall out. And, it increases the risk of inflammation and gum disease as well. While solutions like dental implants can help some struggling after tooth loss, in the long term, the best option is to keep teeth healthy through good oral hygiene habits and by minimizing damage to the bone structure. Damage to the teeth due to tooth decay, gingivitis, and periodontal disease is often preventable with ongoing care and management of oral health. Tooth replacement options may be available. Do you have a lost tooth or are you worried about these risk factors? Schedule an appointment for a dental checkup with East Valley Dental Professionals to learn more about your treatment options.